The monochrome trend continues to rule the runways, showing up in various collections at Fashion Weeks. I once heard that monochrome separates are a big challenge as they limit the ways of accessorizing and mixing and matching. Let me prove it that I cannot agree less. How to wear monochrome in 2014? One of the most popular fashion trends at the moment is monochrome and lots of celebrities have been seen wearing black and white together. There have been monochrome bags that matched monochrome shoes, there have been black and white separates in different graphic prints. But the best black and white look is still achieved by black and white horizontal stripes which apparently are not for prisoners anymore. It is not madness; there is no better colour combination than black and white. 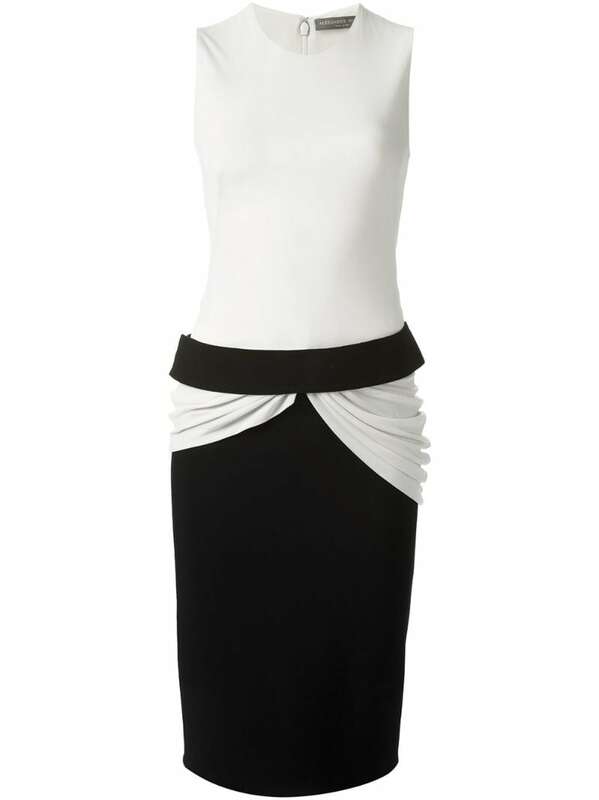 Many designers showcased clothes and accessories in the timeless black and white colourblock effect. As the looks from Balmain and Bottega Veneta demonstrate, clothes adorned with hypnotic images and optical illusions are the most impressive. The other trend is mixing monochrome separates in different patterns and textures to achieve a fall-forward look. A vertically striped monochrome print dress creates the illusion of height, and when paired with the right footwear, creates a long-legged sensation of a woman of medium height. Selection of the right pattern is the trick when it comes to monochrome prints. Do not throw a dress into your shopping cart based solely on its appearance when on a model. Wear it yourself to see exactly how the dress hangs on your body and if it complements your curves. Now that Fall 2014 has arrived cleansing our palettes with bold new pieces, we are especially lusting after monochrome trend. Not only clothes, but also black and white accessories are made to double the impact! Streamlined heels in monochrome are not only popular among fashionistas but also among those who want an instant chic throughout the season. Designers play with all manner of decorative devices to give black and white a fresh attitude. Although Fall 2014 fashion shows abounded with bold colours and radiant orchid is still the leading one, there are some people who would rather break out the fresh colours. On the other hand, bold colours need demure accessorizing. This is where you can turn to a bold, bi-colour bag – the simplest way to add interest to your workwear wardrobe.